AGlaze Surface Sealants are made from a unique blend of Fluorocarbon polymers. Flurocarbons are modern impregnating agents that do not only repel water but also oily and fatty substances. Every physical body, no matter whether liquid or solid, has a so-called surface tension. The greater the difference of these surface tensions of liquid and its contact area, the more distinct is the repellency. Flurocarbons support this making the surface to which they are applied extremely water and soil repellent. Fluorocarbon polymers can be “made to measure” to suit various fields of application. AGlaze Surface Sealants have been engineered to suit applications to many surfaces including paint finishes, carbon fibre, gel coats, textiles, metals and even polished stone and ceramic finishes. 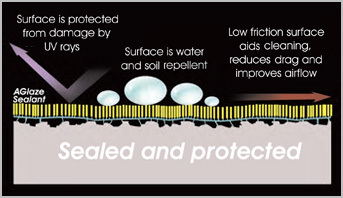 AGlaze Surface Sealant bonds to the surface of the substrate creating an ultra thin sub-micron barrier. This barrier is highly durable, yet remains flexible allowing it to cope with expansion and contraction of the surface caused by changes in temperature. Once cured, the AGlaze sealed surface exhibits several properties; it remains highly water and soil repellent, it protects the surface from UV rays and reduces friction which aids cleaning and improve the flow of air and fluid over the treated surface. The following images show the AGlaze Surface Sealant in action. As the Sealant cures, it bonds the the substrate creating an ultra thin, and far more uniform layer of protection. This new smoother finish no longer provides a “key” for dirt particles to stick to and is much more water repellent as well as being resistant to acid rain and industrial fallout. The smoother surface has less drag than before and so the flow of fluids an air across the surface is also improved. 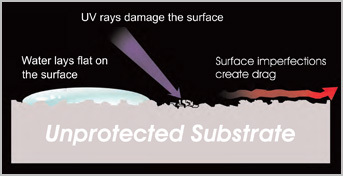 In addition the sealant also contains specialist UV absorbers which absorb UV rays and release them as harmless infra red, preventing UV damage to the treated surface. These two electron microscope images show cellulose before and after treatment. Once treated the resulting surface is far smoother, reducing friction and and creating a more non-stick finish. Dirt particles are less able to stick to the surface making it much easier to clean and resistant to a wide range of pollutants.